I’ve just written a new blog post on the sea creatures you read about in Allie’s Return. Like for Oceania, the posts on sea creatures will be divided. In two weeks, you’ll be able to read about the sea creatures of the deep. This week’s post is focused on animals you’ll find in the sunlit waters. I hope you enjoy it! The Story is Not Yet Over! I’m excited to announce that I’m currently in the process of editing the 3rd book in the Oceania: The Underwater City series! I plan to release it late this fall around mid-to-late November. I’m only sharing the book description here on my website for now. I’ve also included the cover with this post. I’ll have more information to share with you the closer we get to November. I plan to have it beta read in October, so if you’re interested and you’ve already read both Oceania and Allie’s Return, reach out to me and let me know! Enjoy! Successful at delivering the cure for the Second Great Plague to the Land Dwellers, Allie and Dylan return to Oceania. But their rogue actions have cost them dearly. 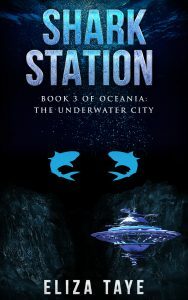 For disobeying direct orders from Mayor Cho, Dylan and Allie are exiled to a remote scientific research station in the Mariana Trench called Shark Station. Located in the second deepest part of the ocean—Sirena Deep—they are thousands of miles away from their beloved city. Accompanied by five adults who ensure that they work hard to run the old station, they’ve resigned to their fate. Yet mysteries of the deep are about to surface and the Sirena Deep may prove to be more dangerous than they ever could have imagined. To celebrate, I’ll be hosting a giveaway of all the current books in the series including The Plague Council from August 18th to August 31st. You can win all three ebooks, an author autograph of the bookmark and ARCs of all future books in the series autographed by me! If you already own all three books feel free to tell others about the giveaway. You can find the link to the giveaway on my homepage or the giveaway tab.